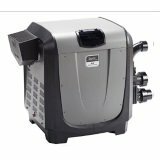 Explore a wide range of Pentair pool heaters available for residential and commercial use. Almost fifty different models of gas-powered pool heaters and heat pumps are at the customer disposal. That is why it is good to know key features, advantages and user experiences. We are going to review here both types, gas heaters and heat pumps, from least to most powerful units for residential use. Gas-fired pool heaters are more diversified, so let’s start with them. 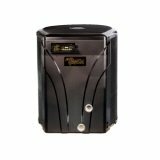 If your pool is small, up to 15,000 gallons, check out MasterTemp 125, the most affordable heater in Pentair assortment, with the power of 125K BTU and price just above $1000. The lightweight (80 pounds) MasterTemp 125 has many features of bigger units – premixed gas combustion technology to provide quick work, aligned with low-NOx emission at the same time, extraordinary 82% thermal efficiency for this unit size, rotating digital display with useful controls. Natural gas and LPG models are available. Everything looks perfect, but customers warn that the unit is a low power one, for small pools only. Beside some complaints about plastic cabinet, there are remarks that heating is much slower than expected... or the users have had unrealistic expectations. The other MasterTemp units come with more power – from 175K to 400K of BTUs and prices from $1800 to $2200. All Pentair pool heaters are available in natural gas and LPG option, and utilizing HD cupro-nickel heat exchanger option instead of copper heat exchanger built-in standard models. MasterTemp heaters are quiet, low NOx certified, ease to operate and 82-84% efficient. We are drawing your attention to the frequent complaint by users: plastic cabinet is easily breakable. Some of them think that it is better to pay more and buy a heater in the store than online, because units are usually delivered damaged. The 400K BTU heat input models are, generally, the most powerful residential gas-powered pool heaters. 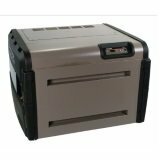 Pentair has recently added to their offer one high-end 400K unit – ETi 400 High Efficiency Heater. This natural gas model is not available online, only in stores. For the price of about $6700 you will get superior quality – extremely durable, the first ever, direct-fire pure titanium heat exchanger TitanTough and efficiency of 96%, the highest of any gas pool heater. Think about average annual savings of more than $300 for 25,000-gallon pool and around $1000 for 75,000-gallon pool, and you will conclude that ETi 400 is designed for large pools in the first place. 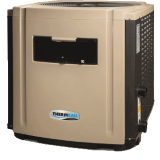 Beside the MasterTemp line and the ETi 400, there is one more gas-powered Pentair pool heaters product line – Max-E-Therm. Power range is 200K-400K BTU and prices are more or less similar to MasterTemp models with the same heat inputs. Design of these heaters is slightly unusual and recognizable. The units are smaller, with registered Sta-Rite features of rustproof exterior, smart electronics and corrosive resistant Dura-Glas cabinet. There are natural gas and LPG models with standard (copper) or heavy-duty (cupro-nickel) heat exchanger. Users have evidenced in their online reviews features they love – remote control and dual thermostat. One of the minor complaints is vertical plumbing fixtures for water supplies. UltraTemp is the brand name of Pentair heat pumps. 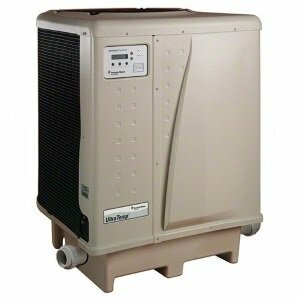 Their characteristics are similar to average modern heat pumps made by the other manufacturers. Titanium heat exchanger has become standard for unit longevity, and LCD board and digital controls for convenient handling. Pentair have added automatic defrost, dual thermostat, AutoSet feature to control water circulation pump, and compatibility with IntelliTouch and EasyTouch automated control systems. Pentair heat pumps come with 75K to 140K heat outputs, in 11 models and black or almond color. Some of them are designed for heating only; the others offer heat and cool mode. 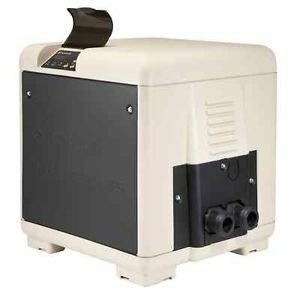 Talking about price, Pentair heat pumps are more expensive than gas heaters, starting at $2700 for small pools and finishing at $6000 for the most powerful heat/cool models. Most of the additional expenditure will be compensated with lower operation costs. Tip: Check out offer of Rebate center on Pentair website. 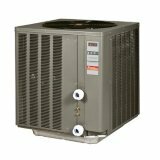 Heat pumps are often on the list of products that, once bought and professionally installed, may be subjected to rebates. Pentair pool heaters are widely represented on the market. If you are living in cold climate, you can rely on gas powered heaters. Heat pumps are more efficient and economic for frequent use in not so harsh climate. Following development of Pentair pool heating units and user experiences, the conclusion is that they can be trusted.